Health Secretary Jeremy Hunt has indicated he will press the chancellor to give public sector staff more pay. He made the comments following a speech in which he praised the way NHS staff and the other emergency services responded to the recent terrorist attacks and the Grenfell Tower fire. He said, in particular, he had "a great deal of sympathy" for the case made by nurses for an end to the pay cap. The cap means public sector staff rises are limited to 1% a year until 2019. Both Labour and the Liberal Democrats promised to scrap this in their election manifestos, but the Conservatives have so far resisted demands pointing out every 1% pay rise in the NHS costs £500m a year. But in the strongest indication so far that the government is prepared to rethink its approach, government sources confirmed to the BBC it was on the agenda. Mr Hunt told a conference of NHS managers in Liverpool he would be putting the case to Philip Hammond personally. He said he had a "great deal of sympathy for the case that has been made on pay" because of the "enormous amount of goodwill and time given free of charge" by staff. "I've had a very constructive letter from Janet Davies from the Royal College of Nursing. I will be meeting with her and will make sure the conversation is reflected back to the chancellor before we make that decision." It came after he described the actions of the emergency services to the terrorist attacks in London and Manchester and then this week's response to the fire in west London as "remarkable". "I had the privilege of seeing first hand what that response was. We had operating theatres being opened up in the middle of the night, we had doctors cycling into work at 02:00 to report for duty, we had the extraordinary work of the paramedics, some of them running into live gunfire thinking they were being targeted but not stopping." The RCN has already warned the government it should prepare for a "summer of protests" unless it backs down on nurses' pay. The union said a combination of pay freezes and caps has meant that nurses have had a 14% pay cut since 2010. They have also blamed this for a shortage of staff - research by the union shows that one in nine nurses' posts are vacant. Mr Hunt also said securing the rights of NHS staff from the EU would be "top of the list" when Brexit negotiations start. 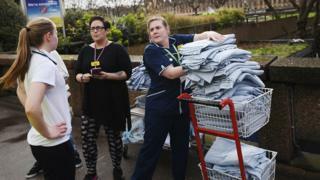 It comes after figures released this week by the Nursing and Midwifery Council showed the number of nurses and midwives applying to work in the UK had slowed to a virtual standstill since the EU referendum. This April, only 46 joined the register, compared to an average of more than 1,000 between April and July last year.